Make a reservation and discover this hotel in Cody, offering a deluxe, hot, complimentary full continental breakfast served daily. Come and enjoy it on our outdoor pergola! 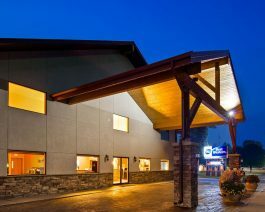 The Best Western Sunset Inn is a AAA 2-Diamond rated hotel; it is the perfect lodging choice when visiting the Buffalo Bill Center of the West, Old West Trail Town and located near Yellowstone National Park. Hotel guests will be near favorite local events including the Cody Night Rodeo, Pow-Wow and Rendezvous Royale. Guests will enjoy the nearby fishing, nearby horseback riding, hunting and snowmobiling in the Wyoming outdoors. Valued guests will enjoy modern, comfortable rooms equipped with cable television and free high-speed internet in this smoke free establishment. For those interested in a spacious dining experience, we also offer a great discount at the 8th Street Restaurant for breakfast hours. Please call the hotel for additional details. Additional hotel amenities include an indoor swimming pool, seasonal outdoor swimming pool, and exercise facility. Hotel guests will receive attentive customer care and the right travel amenities. Deluxe rooms are also available upon request. Open May through mid-October. Pets are welcome with some restrictions.